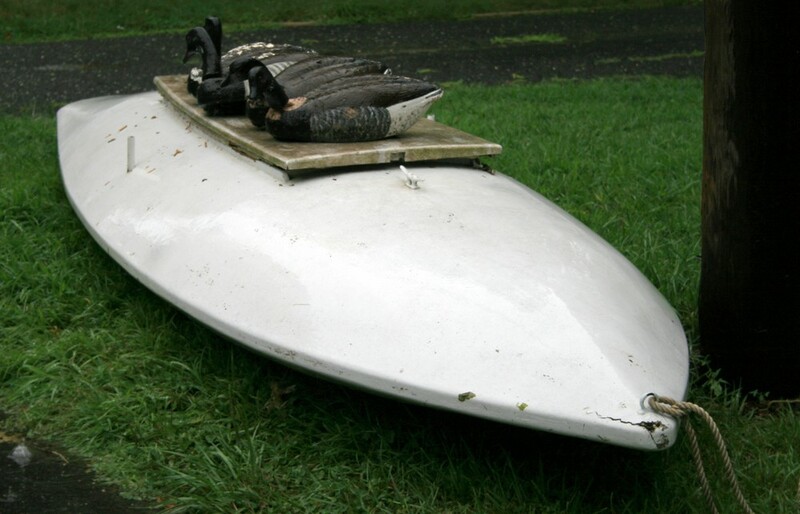 This shapely gunning boat is one I have never seen in use – and yet it holds a special place in my heart. It was built by a man whom I recall vividly – and fondly – from my early youth. 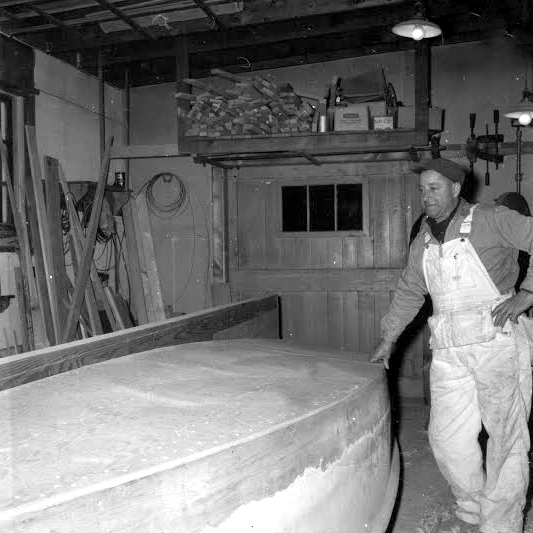 The boat was built – most likely in the 1950s or 60s – by Brud Skidmore. It is now owned by Red Oster and I first saw it earlier this year in Red’s backyard in Sayville. Red is a bayman year-round and guides diver shoots out of one of the last “big rigs” on Great South Bay. Like many terms specific to the sport of waterfowling, particular names for boats, gear and even the birds themselves evolved locally and remain today as relics of an indigenous culture. Such is the case with the name “Scooter”. The original Scooter was “invented” in Bellport Bay – the eastern reaches of Great South Bay – in 1874 by Wilbur R. Corwin. It was originally designed to negotiate a frozen bay that – thanks to the tides – was perforated with patches of open water – what we call either “water holes” or “air holes”. A Scooter could be dragged, piked or sailed over ice of all kinds – and could also be sailed or rowed across open water. In fact, it could “scoot” across the ice, through the water, then back out onto the ice again. The hulls were carefully shaped to run over the ice on metal-shod runners and could go from water to ice either forward or backward. Scooters caught on quickly – to the east into Narrow and Moriches Bays and west throughout Great South Bay. They became the winter vessel for gunners and baymen and even for the Lifesaving Service (now Coast Guard). When the battery was finally outlawed on Great South Bay in 1935, the cumbersome winged contrivances were replaced by Scooters anchored in the open bay. Many, like the Skidmore Scooter, retained the capabilities to hunt in either frozen or unfrozen waters. The well-known Scooters from the east were built by Wilbur Corwin, Benjamin Hallock and Oliver Howell. To the west, one of the better-known builders was the firm of Dodge & Crowell – hard on the east bank of Orowoc Creek in Islip. 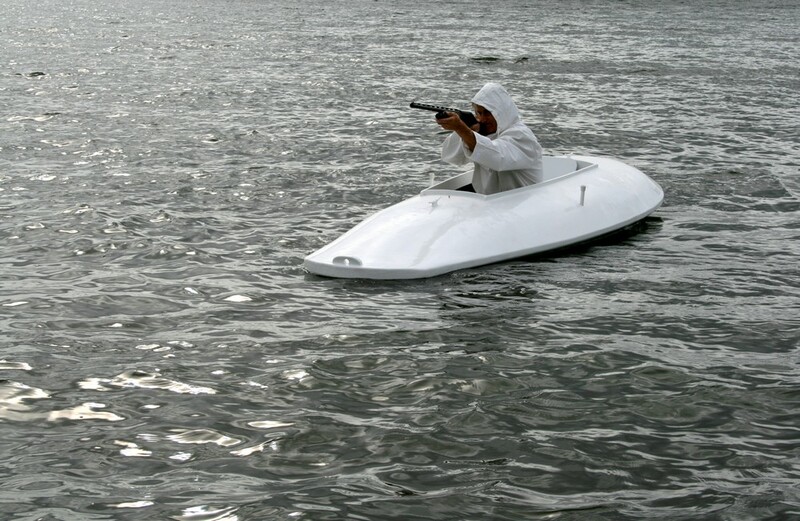 As with any specialized craft, the details were refined to meet the local conditions. 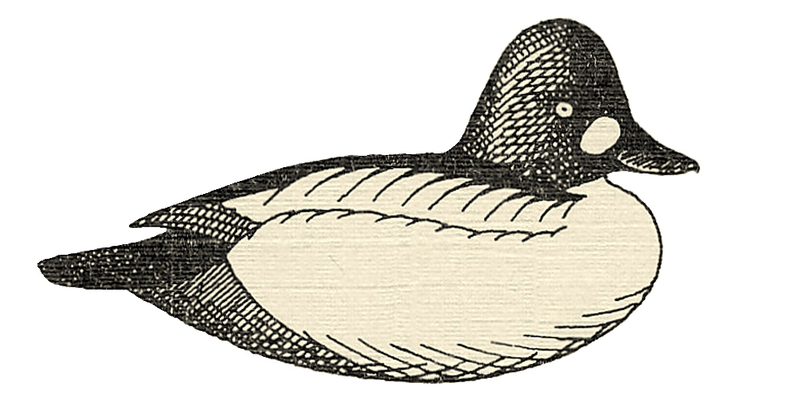 Whereas the eastern Scooters were designed for use in the ice and also as “grassboats” to hunt the saltmarsh, many of the western boats were designed for use in the ice and in the open bay. Hiding best in the open bay resulted in higher-crowned decks and lower gunwales – what is known as the “whaleback” design. Brud Skidmore built his Scooter from the lines of a Dodge & Crowell whaleback Scooter. 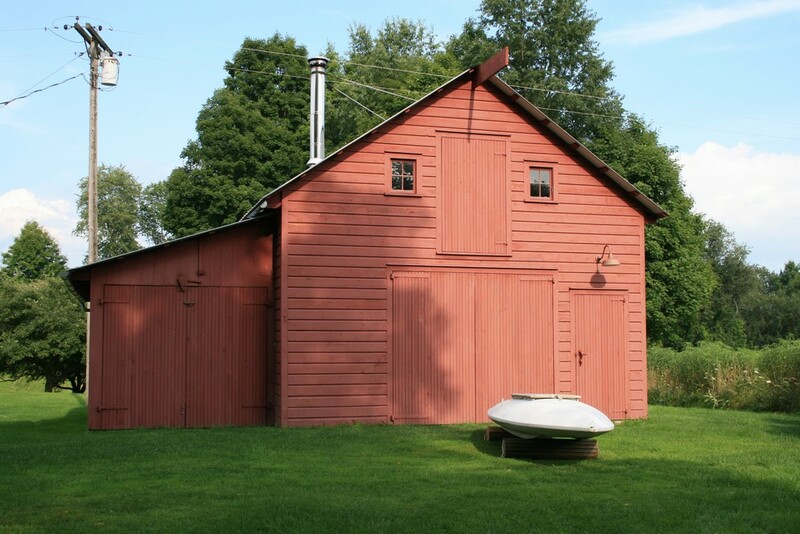 Whereas the Dodge & Crowell craft were carvel-planked of White Cedar over bent (steamed) frames, Brud built his of 1/4″ marine plywood (fir) over plywood frames. I probably met Brud before I could remember anything. Brud was a friend of my Dad . My Dad had worked at Brud’s East Islip Lumber before becoming a State Policeman and – always working at least two jobs to provide for his family – had his woodworking shop there for a few years, probably in the late 1950s. I recall being in the shop with my Dad after dinner. I would play among the sawdust and cutoffs on the floor while be built cabinets and – along with Brud – the occasional boat. Finally, I just learned from my Mom that “Brud” means “brother” – a common nickname among the Dutch and Germans. 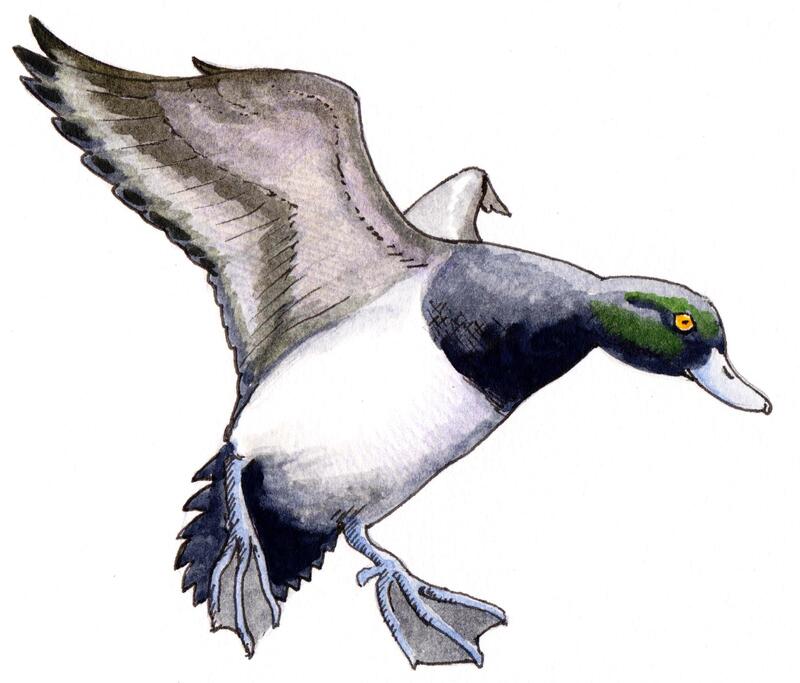 Like my Dad and so many others of that era, Brud loved nothing more than hunting Broadbill – the Greater Scaup that wintered on Great South Bay in prodigious numbers – well over 100,000 birds each year. While Broadbill could – and certainly were – hunted from shore rigs and in the ice, the “ultimate” was to pursue these finest of gamebirds with a “big rig”. A big rig was simply the rig used to hunt Broadbill in an open Great South Bay – and it evolved directly from the battery rigs. It usually consisted of three different vessels – each with its own purpose. The tender (or “mother ship”) was a big cabin boat – replete with stove – that towed both a stool boat and a Scooter. The stool boat held all of the decoys and was used to set and pick up the rig. The Scooter was the floating blind from which gunners shot. Gunners cycled in and out of the Scooter during the day, ferried back and forth by either the stool boat or the tender. When not laying in the Scooter, gunners could observe all of the action from the comfort of a warm, dry cabin, often with hot drinks or soup at hand. Happily, the years and the elements have wrought only minor damage to the Skidmore Scooter. When I met Red – and his brother Steve – in the rain last Saturday, the obvious damage included rot in the hatch cover and in a bit of the coamings, a few “penetrations” of the ‘glass skin, and some suspicious softening around the pipe oarlock stanchions. So, the Scooter was lashed to my duckboat trailer and rode happily the 250 or so miles north to Pencil Brook Boatworks. Not surprisingly, Red also sent a few Herter’s Model 81 Brant stool north with me – for their own brand of special attention. 2 – A sense of the high-crowned decks and low “beltline” can be seen here. 3 – Scooters are widest forward to help maneuver through broken ice. 4 – Typical whaleback sections. 5 – A nice cockpit with a chocked backrest. 6 – The nose is damp beneath the ‘glass but no softening of the wood. 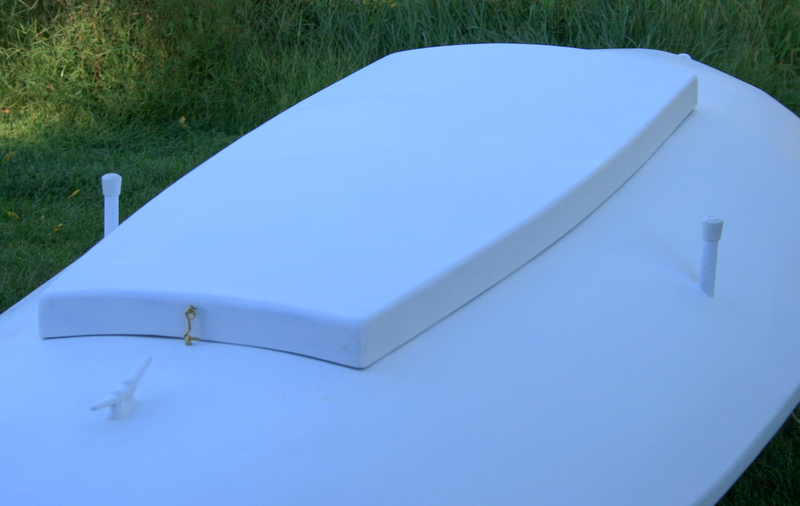 7 – I have not seen this coaming detail on other gunning boats. 8 – Some rotted coaming will need to be excised and replaced. 9 – The pipe oarlock stanchions are removable – but did let in some rot-producing rainwater over the years. 10 – The stanchions are well-supported at top and bottom. 11 – Quite a bit of softness around each stanchion may be my biggest task – and a bit of a challenge. 12 – This is a nice minor blemish – easily repaired. 13 – I doubt there is any rot in the stern. 14 – Once again, nice and minor. 15 – The fantail hides the boat nicely from incoming birds. 16 – But, I am surprised to find no fairlead for the stern anchor. 17 – The cockpit cover has lost most of its edges to rot. 18 – Notice how Brud pieced together scraps of plywood to cover the whole cockpit. 19 – I plan to make an entirely new cover – with a bit more crown. 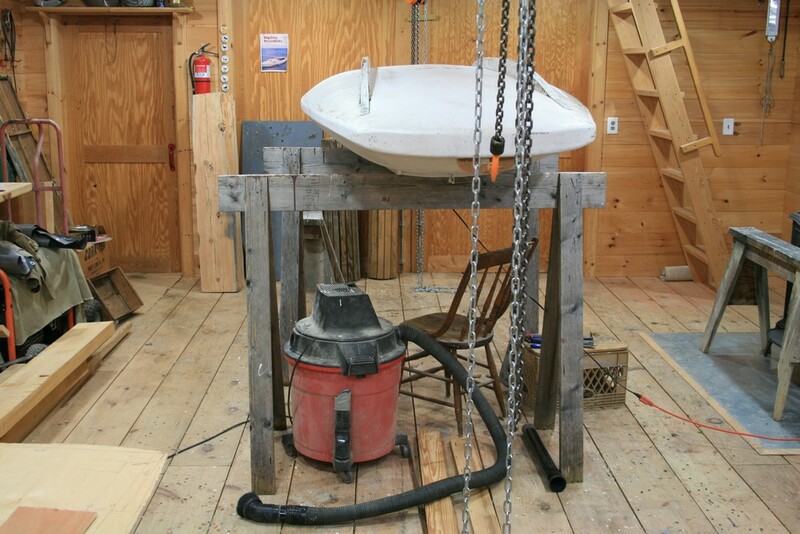 20 – I tacked on a temporary stern fairlead for hoisting. 21 – Firmly atop the horses and out of the weather. 22 – The first step is to get the ‘glass away from any damp wood so it can dry thoroughly. Up on the “high horses”, the Brud Skidmore is upside down so I can work “comfortably” on the inside – especially on the stanchions. I began by cutting and grinding back the ‘glass where it had been penetrated. The nose – around the bow eye – was the worst – but it still was not bad. The wood had not gotten soft and mostly needed a thorough drying-out. There were a few more minor penetrations toward the stern. They required a quick fairing back with the grinder (40-grit on a 7-inch disc) and then time to dry. 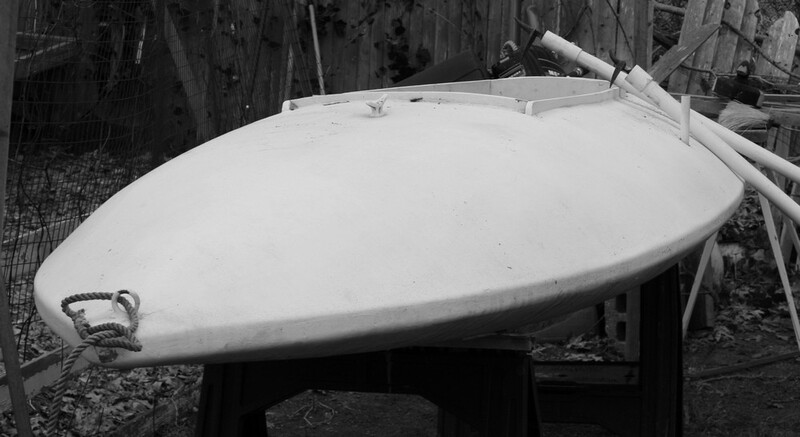 Rot in the coaming required me to excise about 24 inches on the starboard side and both oarlock stanchions required major – and challenging – attention. 1 – I could remove most of the rot with my fingers. 2 – I cut a dutchman (or graving piece, if you prefer) longer than the area of rot. 3 – I used a straight bit in my router to remove the coaming to my scribed line. 4 – Epoxy was thickened with cabosil and microballoons – and everything was clamped overnight. 5 – My orbital sander with 80-grit did most of the fairing. 6 – The pipe oarlock stanchions were chocked a the deck and at the hull but were installed loose. 7 – To not lose the location of the hole during surgery, I drew centerlines far beyond the area of rot. 8 – The big hole at the bottom is through the deck – because I am working with the boat upside down. 9 – On the other side of the boat, the rot had penetrated the hull plywood – but not quite through. 10 – I used a floodlight to warm and dry the rotted areas overnight. 11 – Heavy cardboard with poly covering backed up the first big fill. The epoxy included 1/2″ ‘glass fibers for some structural integrity. 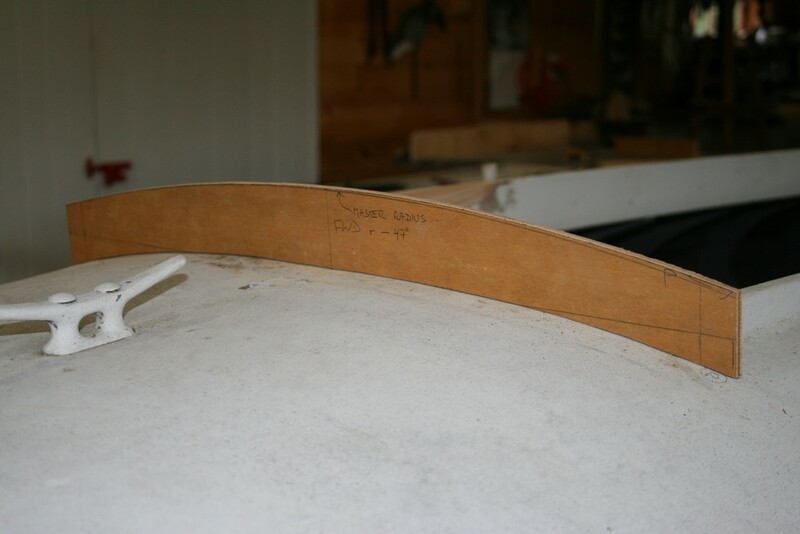 12 – I re-drew the centerlines after fairing the cured epoxy. 13 – This jig helped to guide the drill vertically through the deck and the new chock behind it. 14 – Here are the old and new deck chocks. 15 – The new hull chock gets bored to receive the lower end of the pipe. 16 – Each pipe was plugged with a dowel set in epoxy for all but the upper 3 inches – to leave room for the oarlock shafts. 17 – The final deck fairing was done around the pipe wrapped in cellophane tape so the epoxy would not stick. Then this area was re-glassed. 18 – The edges of the new hole are chamfered slightly. 19 – The pipe is set in 3M 5200 at both the deck and in the hull chock – so they will not move and not let rainwater in. 20 – Neighbor Kirk Fox helped me make these fancy plugs to keep water out of the pipes when not in use, but…. 21 – I found a simpler solution. Other minor tasks included a permanent fairlead for the stern – so the Brud Skidmore will lay at anchor without yawing. 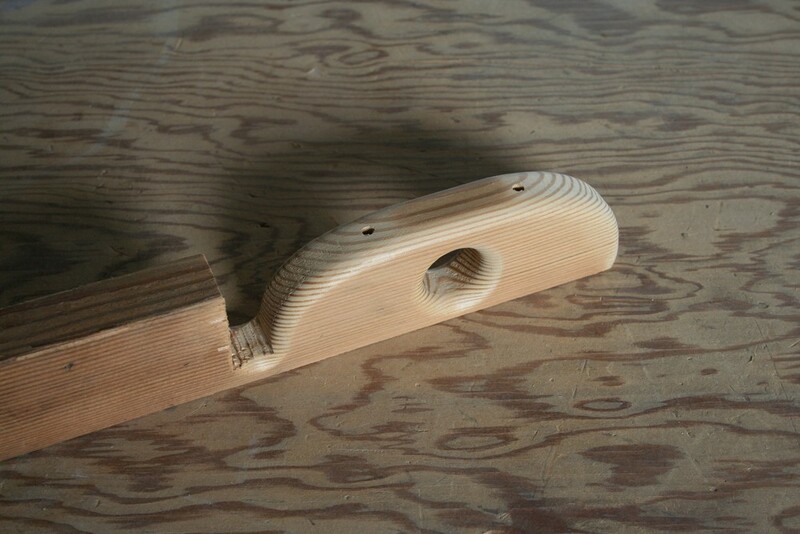 The fairlead is fully machined – with bandsaw and router while still attached to the original piece of lumber – some vertical grain Douglasfir. It was finally cut free on the table saw. Then, it got two sealing coats of epoxy before it was fastened to the deck with SS screws and thickened epoxy. The next job was a new hatch – from scratch. I began by scribing the crown of the deck forward of the cockpit to establish the lower curve. The upper curve was similar but the crown was drawn on a 47-inch radius. I did not use the scribed crown of the deck because it flattened off a bit on the centerline of the boat. The 47-inch radius became the “master curve” and was used for all of the transverse frames. The framing is all Cypress – and the sheathing is 1/4-inch Lauan plywood – scavenged from a pattern on another project. 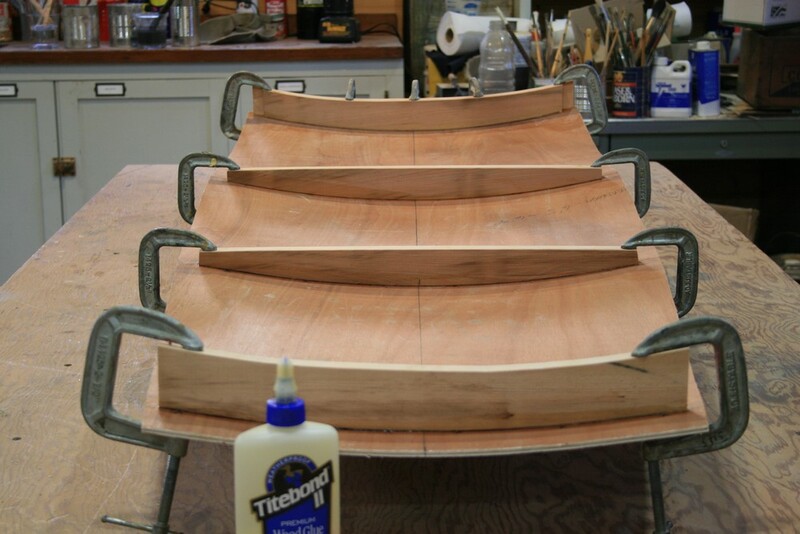 After clamping with Titebond II, the plywood was nailed to each frame with #14 x 7/8″ bronze boat nails. The outside of the hatch was was sheathed with 4-oz ‘glass and epoxy and the underside was sealed with grey primer. All done. It was important to owner Red Oster to return the boat to a sound condition – but at least as important was honoring Brud. 1 – After 3 coats of Flat White Pettit paint, applying the name along thr curved foredeck required some creative problem-solving. 2 – The interior – at least near the cockpit – was given a quick coat of Flat Grey to clean it up. 3 – The corners and edges of the floorboard and backrest were rounded and faired. 4 – A comfortable shooting nest. 5 – Here is the finished fairlead at the stern. 6 – The hatch was ‘glassed and painted to match. 7 – Brass hooks&amp;eyes will keep the hatch on – at least when it’s in storage. 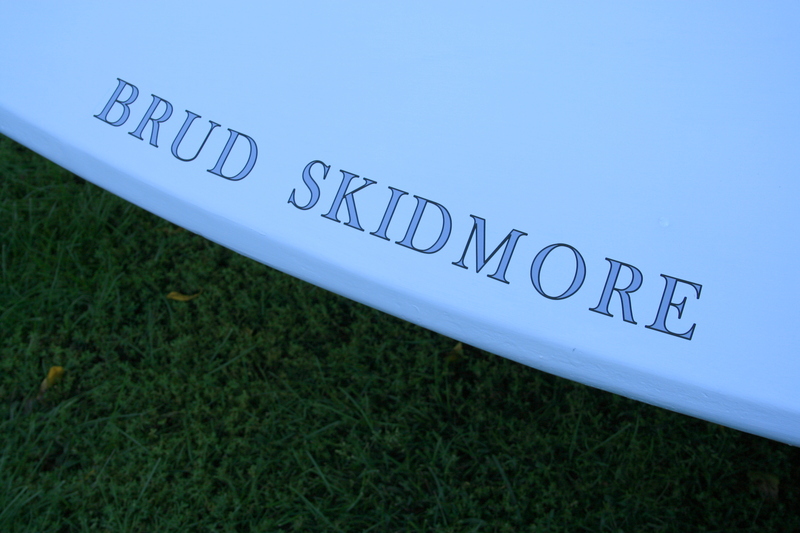 8 – The Brud Skidmore is ready to return to saltwater. 9 – Her nose is once again ready to meet the head seas. 10 – She lays beautifully. 12 – Here they come…. 13 – Bird Number One – down! 14 – Bird Number Two – down! 15 – Bird Number Three – the Triple the hard way!